The creation of the Children’s Leukaemia & Cancer Research Foundation (Inc) was inspired by 9 year old Jennifer Harper, who was diagnosed with leukaemia in 1977. When her father, Peter Harper, discovered that there was no research into children’s leukaemia being done in WA, he set out to raise funds for this purpose. Together with other parents of children with cancer and with the support of Princess Margaret Hospital for Children, the Children’s Leukaemia & Cancer Research Foundation (Inc) was formed. 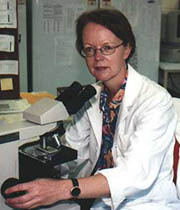 In 1983 the Children’s Leukaemia & Cancer Research Laboratory was established on the children’s hospital (PMH) campus and in 1984 Dr Ursula Kees, a Swiss born scientist was recruited from the German Cancer Institute, to head up the Research Laboratory. Whilst Jennifer inspired the creation of the Foundation, she did not win her fight against leukaemia, she died in 1978. Our Research Laboratory has a very co-operative relationship with the hospital’s Oncology Total Care Unit and plays an integral part in the treatment of children with cancer in WA. In 1990 the Oncology Total Care Unit became a full member of the Children’s Cancer Group (CCG), one of the largest co-operative research groups in this field. The PMH Unit is not only participating in trials of new chemotherapy treatment protocols for cancer patients, but has been accredited as a CCG bone marrow transplantation unit which has greatly improved childhood leukaemia survival rates in WA. The scientific expertise provided by Dr Kees was one of the critical requirements in obtaining this approval. This CCG membership has provided the opportunity to study patients enrolled on CCG protocols.